100% natural split(open) flower pollen. Convenient sticks with 1 g of flower pollen each for direct consumption or dissolved in a glass of water. Ideal for people who want to choose this type of natural plant products. 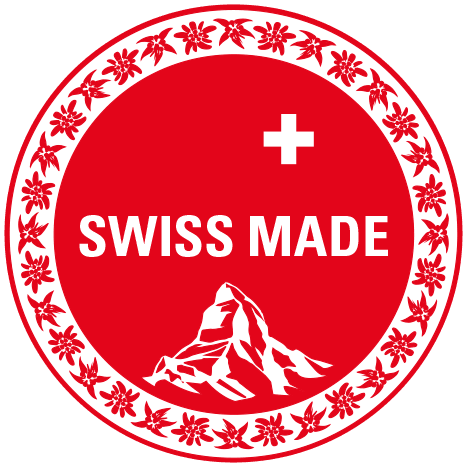 Manufactured and quality controlled in Switzerland. Pollen – also known as flower pollen – are the male reproductive cells of plants. 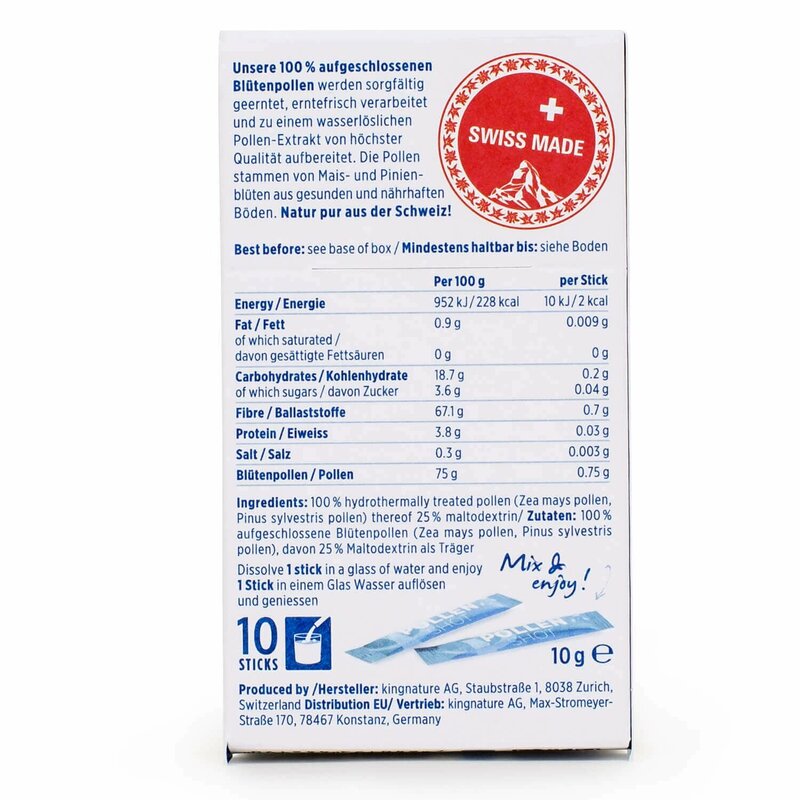 They contain a wide variety of plant substances, including traces of minerals, vitamins, trace elements, enzymes, essential fatty acids, amino acids and secondary plant substances such as certain flavonoids and polyphenols. If you require a high-quality product then this is a must buy product. Pollen Shot! The hard pollen coat protects the valuable ingredients of the pollen. It consists of specially formed proteins that can sometimes cause allergies in the human body. During the digestion process, the pollen coat is largely preserved and remains unopened. With Pollen Shot, the pollen shells were treated and broken open using a special, gentle and patented process. This is also known as split (open) pollen. Now the body can absorb the ingredients in the pollen. As the pollen coat is no longer intact, the risk of allergies is also greatly reduced. As part of our duty of care, you should know that a minute amount of the pollen shots may still contain traces of allergenic substances. Our 100% split flower pollen is carefully harvested, processed soon after being harvested and processed into a water-soluble pollen extract of the highest quality. The flower pollen is harvested with special giant vacuum cleaners. 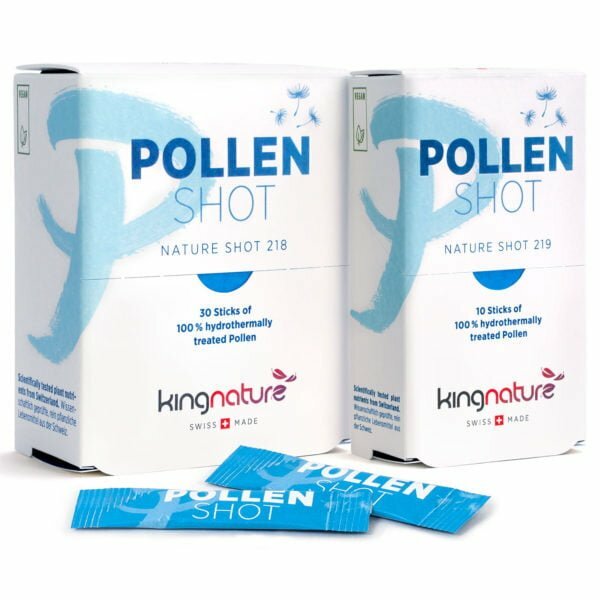 This ensures that only pollen from the desired species and from controlled cultivation are included in our Pollen Shot. The pollen comes from maize and pine blossoms grown in healthy and nutritious soil. Nutrients in conventional pollen products (not split), are only partially absorbed in the intestines (3-12% are mentioned in most research literature). The hard pollen coat cannot be opened and is not digested well during the digestion process. The pollen grain is thus excreted mostly intact. 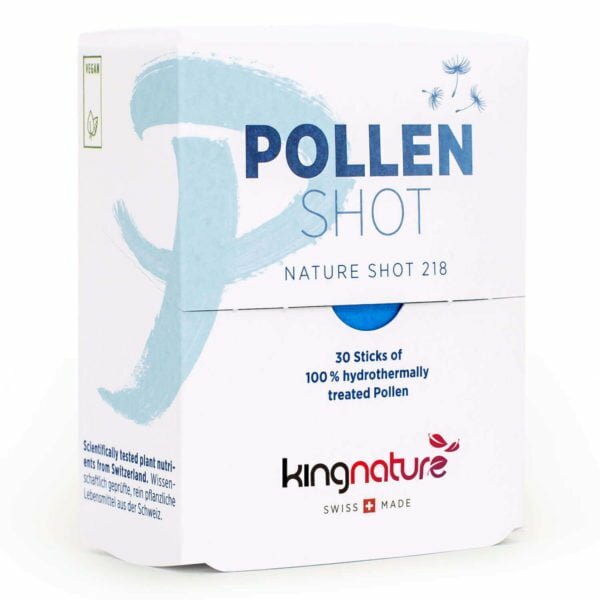 Pollen Shot is different, due to the pollen grains being split open, the body can naturally absorb the ingredients much more easily during digestion. When taking into account the differing bio-availability, the split pollen in Pollen Shot is more cost-effective than pollen products without split pollen. The pollen in Pollen Shots comes from Sweden. We buy the pollen in Sweden as a raw material and test and process it in Switzerland. 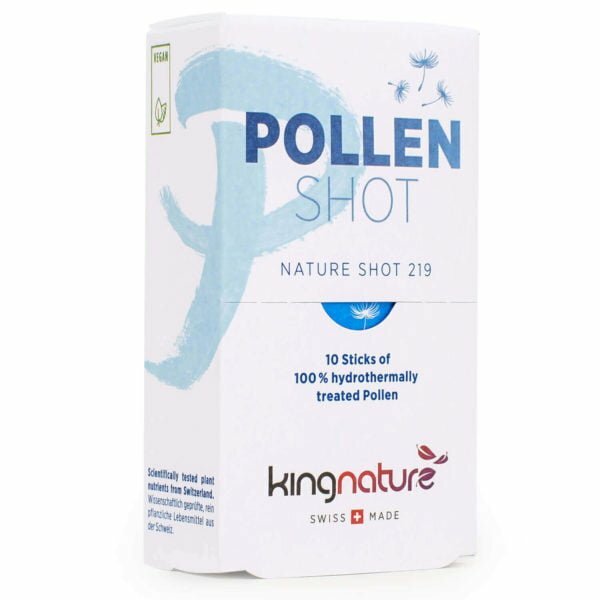 What are the advantages of Pollen Shot? – Split (open) pollen shells offer a higher bio-availability. – No allergies due to destroyed pollen coating. – Mechanical harvesting: Only the desired pollen species are harvested in a controlled manner. Buy Pollen Shot online now: We also accept Visa / Mastercard and Postcard. Orders exceeding CHF 120.00 are shipped free of charge (within Switzerland). EU customers please use our EU-Shop. Pollen Shot is available in packs of 10 or 30 sticks. 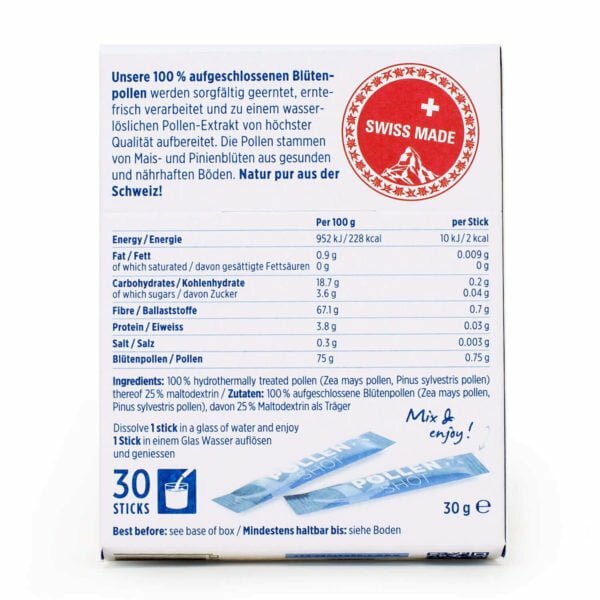 Each stick contains 1 g of pure, split (open) flower pollen. 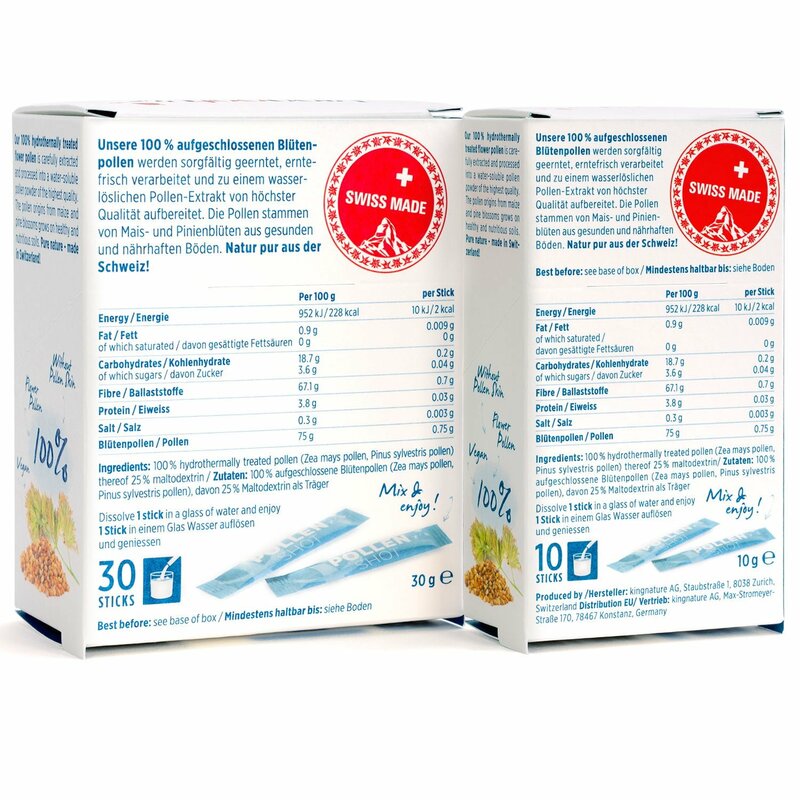 Net content per pack is thus 10g or 30g respectively. 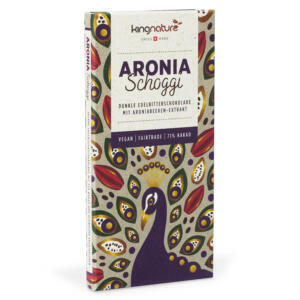 Availability – this product is in stock. Flower pollen is also available in a similar composition in capsule form – please also see Pollen Vida with natural vitamin C from Acerola powder. 1 Stick in a glass of water or your favourite Sports drink. Wait until fully dissolved and enjoy. Can also be taken directly onto the tongue.